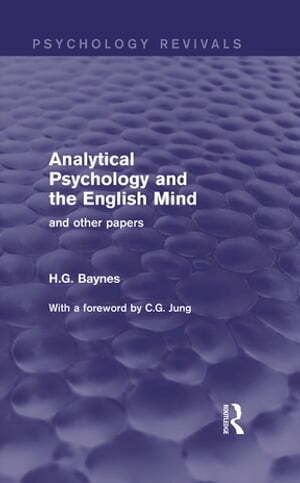 Collins Booksellers - Analytical Psychology and the English Mind (Psychology Revivals) by H.G. Baynes, 9781317518372. Buy this book online. Originally published in 1950, the name of the late Dr H.G. Baynes was already well-known as a leading exponent of and translator of the writings of Professor C.G. Jung, as author and as psychotherapist. The essay which gives it title to this varied and interesting collection of writings, shows clearly Dr Baynes’s gift for illuminating a familiar subject with fresh insight drawn from his wide knowledge of the unconscious mind. He can make the unconscious real to us, and can convince us that myth and dream are expressions of vital problems of the human soul. The collection includes material to interest many types of reader, from The British Journal of Medical Psychology, from Folk-Lore, from The Society for Psychical Research. But perhaps most full of interest for the majority of readers are the first three chapters of an unfinished book – What It Is All About; here we find an admirable introduction, given with a wealth of illustration, to the main concepts of Professor Jung’s analytical psychology. Dr Baynes made Professor Jung’s thought his own, without loss of his own originality. He can touch with significance any subject on which he writes, whether it be the problem of the individual or the kindred problems of humanity.